The paper describes the results of a survey carried out to identify the Italian universities which are part of Second Life and to analyse the academic services they are able to offer in this virtual environment. The objective of the research is to study the ways of enjoying this environment and to understand how these universities exploit the “immersive” qualities and typical potentialities of virtual reality (Jacobson, 1994). Here is the list of Italian universities so far examined: University of Perugia (CLA - University Language Centre), University of Torino, University of L’Aquila, University of Salerno (Dipartimento di Matematica e Informatica). The observation was focused on the: - exploration of spaces, structures and environments (open space - classrooms - offces - laboratories) - analysis of academic services (orientation offce – student career offce – student assistance) - analysis of how teaching, participants and interactions are organized. Then, we also carried out in-world interviews with teachers and/or managers of virtual universities to refect bout the meaning of “landscape”, a signifcant and decisive element of participation. Desiderio, A., Vitale, V., Piccolo, V., Esposito, G. & Faiella, F. (2009). Teaching in virtual worlds: educational experiences in Second Life. Journal of e-Learning and Knowledge Society, 5 (2), 87-93. 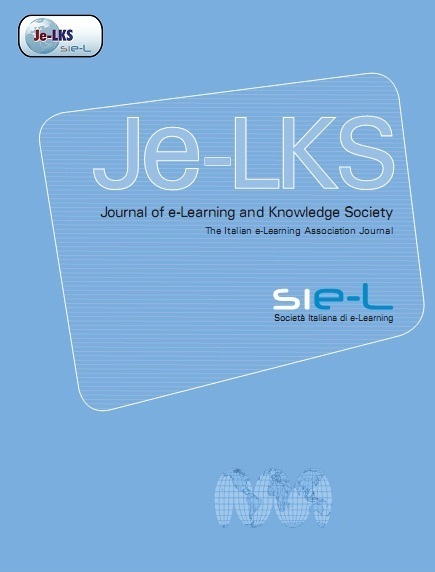 Italian e-Learning Association. Retrieved April 24, 2019 from https://www.learntechlib.org/p/43428/. Banzato M., Corcione D. (2008), Second Life. La grande guida, Bologna, CLUEB. Barry J. (2007), Best Practices in Using Virtual Worlds For Education, URL: www.holymeatballs.org/pdfs/BestPractices.pdf. (verified il 01 Settembre 2009). Berretta G. (1998), Lo stato del virtuale, in: Jacobelli, (a cura di), La realtà del virtuale, Roma-Bari, Laterza. Carr P., Pond G. (2007), Second Life. Gu ida tur is t ica essenz ia le, London, Pan Macmillan. Castronova E. (2005), Synthetic Worlds, Chicago, University Press of Chicago. Granelli A. (2006), Il sé digitale. Identità, memoria, relazioni nell’era della rete, Milano, Guerini e Associati. Jacobelli J. (1998), La realtà del virtuale, Roma-Bari, Laterza. Jacobson L. (1994), Realtà Virtuale con il personal computer, Milano, Apogeo. Jonassen D.H. (1995), Supporting communities of learnes with technology. A vision for integrating technology with learning in School, Educational Technology, 35,4. Jonassen D.H. (1994), Thinking technology. Toward a costructivist design model, Educational Technology, 34,4. Lave J., Wenger E. (2006), Apprendimento situato, Trento, Erickson. Maldonado T. (1993), Reale e virtuale, Milano, Feltrinelli. Piccolo V. (2008), Second Life: l’esplorazione di nuovi spazi formativi. Tesi di laurea non pubblicata. Salerno, Università degli Studi di Salerno (relatore prof. F. Faiella). Ragone E. (2007), Tecniche didattiche in Second Life, Tesi di laurea non pubblicata. L’Aquila, Università degli Studi dell’Aquila (relatore prof. G. De Gasperis).